I don’t write many personal letters anymore, even though I did during my childhood and young adult years. These days I send emails, texts, thank you notes, and an annual Christmas letter. When Christmas letters became popular, I turned up my nose at them. I thought they were too impersonal. But life as a working mom and wife with two children became busy. In the days before cell phones and social media, I wanted to keep in touch with far-flung family and acquaintances. Writing a Christmas letter was a convenient solution. I insert a few photos into the letter, print it on our home printer, stuff the letters in envelopes, and mail them. And I always I toss a couple of hard copies of our Christmas letter into a file folder. Each year, I pull out that folder. It’s fun to look back at years past and be reminded of simple family activities: painting the sun room … replacing the Civic with the Camry … the hugs I gave my children on 9/11 … the lessons we learned in a move across 3 states. We’ve been purposeful in writing and sending a Christmas letter each year. But now, those memories on paper have created a unique legacy: we have a written family history I can pass along to our children and a reminder of where we have been. 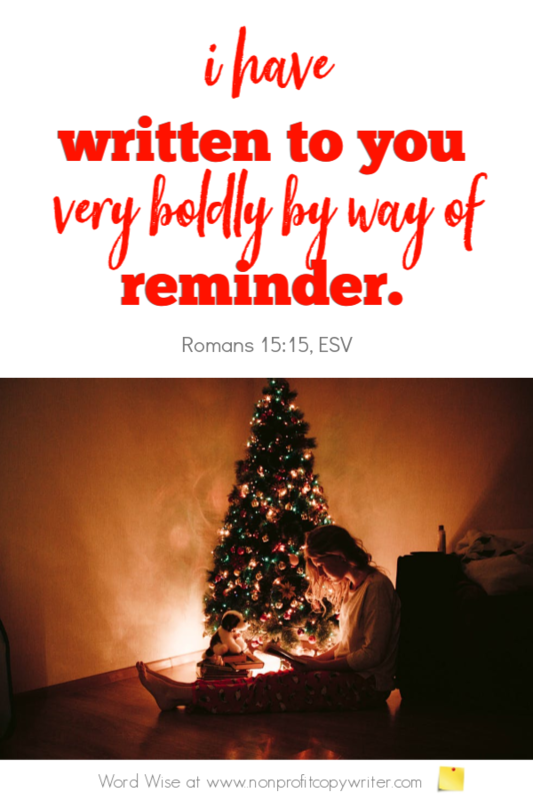 What I first thought was impersonal – a Christmas letter – has become personal indeed. Writing letters creates a personal history. It’s tempting to race through the holidays. Let me stop and record how You have worked in my family over the last year. Get more devotionals for writers delivered to your inbox each week.